All items are served buffet-style, unless noted otherwise, with quality disposable plastic cutlery and tableware. Compostable alternatives are available for an additional cost. Minimum group size is 15 persons. 48 hour notice required. All food and beverages are subject to 15% gratuity and 4.712% Hawaii State Tax. 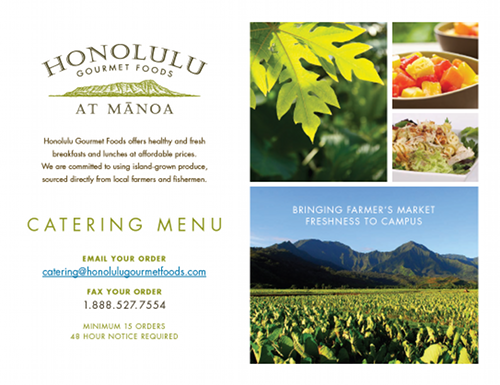 Please download and print the Honolulu Gourmet Foods at Manoa catering menu PDF by clicking here or on the image below. You’ll find the order form on the last page. For an example of our Special Events Menu click here. Please “No Phone Orders!” Please place your order via email or fax and include any special requests. Our staff will confirm all orders via email prior to delivery. If you have questions or need to make changes to your order, you can also reach us at 808-489-9474.